On September 22, a U.S. Marine Corps AV-8B Harrier II ground-attack aircraft that come from the U.S. training area Hotel Hotel crashed in the water 153 kilometers east of Cape Hedo, Kunigami Village. 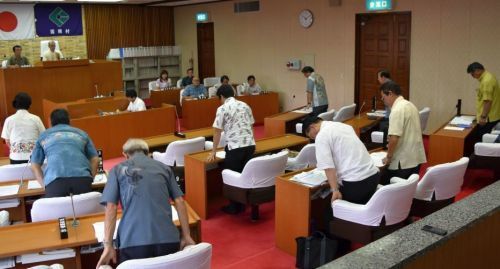 In response, the Kunigami Village Council (chaired by Toshimitsu Kanjo) unanimously adopted a protest resolution and a written argument on September 27. The resolution is requesting an investigation into the cause of the accident be announced promptly, flights of AV-8B Harrier II aircraft be halted, and that all operations at Area Hotel Hotel and Area Alpha be shut down. Area Hotel Hotel is comprised of air and water space to the east of Okinawa Island, and Area Alpha is exclusively air space just north of Area Hotel Hotel. The protest resolution stressed that in the waters off the east coast of Kunigami Village where the crash occurred, the Kunigami Fisheries Cooperative operates nine payaos (artificial floating reefs where fish congregate) that are frequented as a preferred fishing spot. Some of the fish regularly caught there are tuna, skipjack tuna, and large squid. The resolution went on to say that the intense training exercises that take place in the air over those waters threaten the safety of the fishermen’s lives, assets, and operations. However, the fishermen bear their anger in the form of firm opposition. The Council is going to address this resolution to five people including the U.S. Ambassador to Japan and the commander of the U.S. Forces Japan. The argument will be addressed to five people including the prime minister and the minister of defense. On October 3, all members of the Kunigami Village Council, Mayor of Kunigami Village Hisakazu Miyagi, and other villagers will coordinate how to directly protest and appeal to the Okinawa Defense Bureau.